On February 25th around 5pm a shooting was reported to Rialto Police on Baseline just East of Cedar. 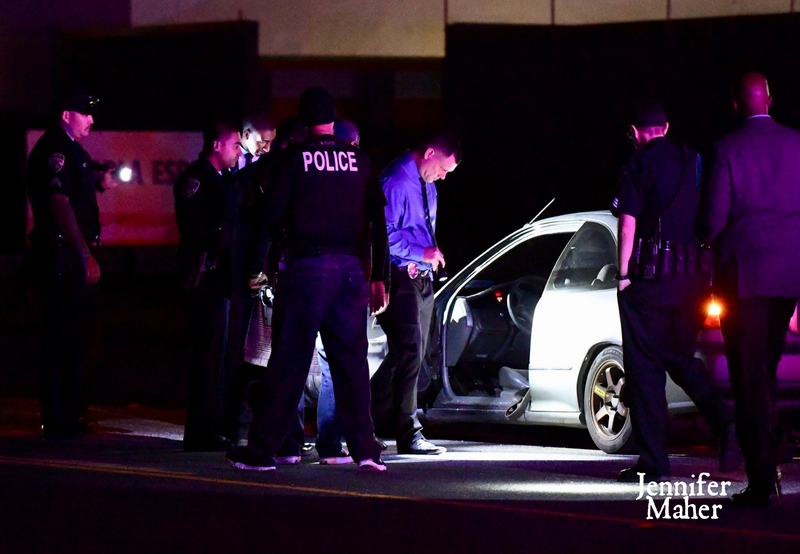 When Rialto Police arrived on scene they discovered two victims shot in a vehicle that was facing Westbound. Witnesses said that the victims vehicle was approached by the suspects vehicle and while in motion and while side by side shot into the victims vehicle numerous times striking the two occupants. Rialto Fire arrived on scene and transported the victims to Arrowhead Regional where life saving treatment but both victims passed away due to thier injuries. Still at this time Rialto Police do not have any suspects. The official statement from Rialto Police Public Information Officer Lt Stella is that they still do not have a motive in this case. The incident shook the quiet community of Rialto known as the Flores Park Area and snarled traffic for hours as Rialto Police worked late into the night investigating this tragic event. Rialto was once known for violence like this in the 90’s but has seen a sharp decline in violent crimes especially car to car shootings. To make matters worse one of the victims of this crime was a High School Student from Carter High School Jaylen McClain. Parents and staff from Carter High School said that this week counselors were on hand to help students and staff deal with this tragic loss. Officers speaking to students also spoke about first getting to know Jaylen when he was 9 years old and say that it is tragic that something in his life led him to be killed this way. Stayc Paul “I was on my way to take my Grandbaby to softball practice about 4:50pm. I was headed down baseline. I was at the light, as I crossed cedar ppl were honking at a gray 2 door Honda Civic because he was half in one lane half in the turn lane. Looked like he was shot in the head. He was in the driver seat, and his head was slumped back. It must’ve just happened when I passed. I didn’t see a second person though”. What is sad is 10 years ago this community was dealing with gangs, drugs and graffiti coupled with a lot of home invasion robberies. A group of residents banded together to help Rialto Police deal with the unwanted crime in their neighborhood. A lot of good work was done for a few years and crime in this area was down dramatically. When Rialto Police started giving up on resident outreach in this area because some in the community were not comfortable with corruption going on inside the department and city things have taken a sharp decline. Just one week prior to this shooting an armed robbery and suspect pursuit ended behind the communities elementary school prompting school officials to hold an brief lock down. Drug activity has been on the rise in this community along with personal property theft and graffiti. Nobody wants to see Rialto slip back into crime and unrest but nobody knows how to stop the slide? On Saturday February 23rd the 1st annual Coffee & Donut Festival was held at the National Orange Show in San Bernardino. 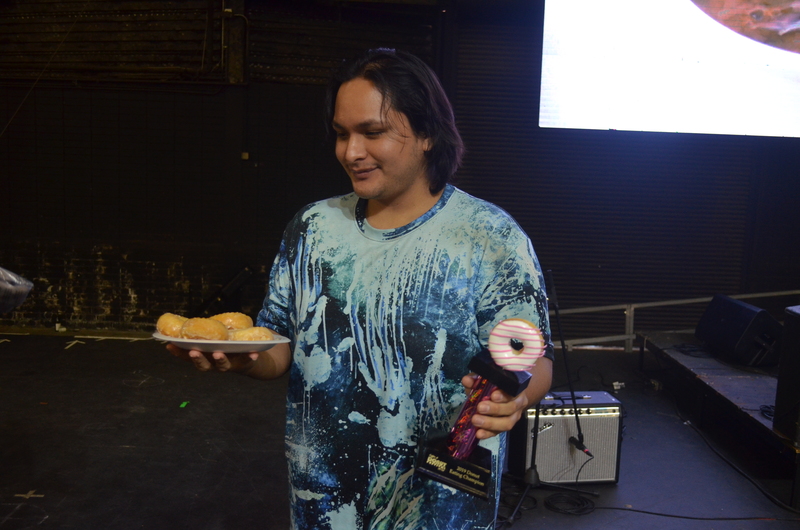 Among the vendors, samples, music and fun was a Donut Eating Contest! Ten People took on the challenge of being the person to eat the most yeast raised glazed donuts. Each person was given a dozen donuts to try and finish as many as possible in three minutes. There were men. women and some kids that tried to take on this task. The battle was fierce as donuts were shoved into mouths and a winner emerged. Tony from Rialto finished Seven donuts in Three minutes time beating out Nine other contestants and eating two more donuts than the next closest finisher. Tony also said that his favorite Donut is the Maple Bacon Donut! With homeless population increasing every single day and the core of the city falling into disrepair many of the regular unconnected people in Rialto are asking if our leaders still have what it takes to lead all of Rialto. There is development happening in the North and South ends of the city but as you move closer to the city center the decay becomes quite evident. This question isn’t just something whispered about in quite circles but people are asking it out loud in public forums and there really isn’t any answer to the questions. At the Rialto Unified School Safety Seminar the question was asked multiple times about what the city and schools are doing to deal with homelessness and the crime and consequences that come with them. Rialto Police Lt. Cameron Nelson said that the police departments hands are tied by new public camping laws (nobody ever references a specific law). The problem has become so bad that parks and schools are now dealing with homeless living in the or near them. One are that was brought up at the school safety seminar was the walking trail behind Rialto Middle School and Warner Elementary School. Both of these schools have access gates that open up into this trail. This BLOGGER brought up many concerns with this trail and having access gates to the schools. The powers that be said I was crazy and just trying to get in the way of progress. Now we have unstable people living where kids walk to school and have access to the schools. Does a child have to be hurt or go missing before anyone listens? When it comes to what our leaders it seems that most of them are ok with Rialto becoming an homeless magnet. Mayor Deborah Robertson seems on a fast track to begin opening housing shelters in Rialto. When new laws are thrown in the public’s faces as the reason that more isn’t being done to fix the problem I wonder what benefit we get from the HUNDREDS of THOUSANDS of $$$$$ we spend on lobbyists and having our elected officials travel with our tax dollars to Washington and Sacramento. Some if the worst areas of our city are the main corridors that people travel every single day! Areas like Route 66 that are full of shuttered businesses, graffiti and homeless are far from the beacons of progress and prosperity that our leaders preach about. 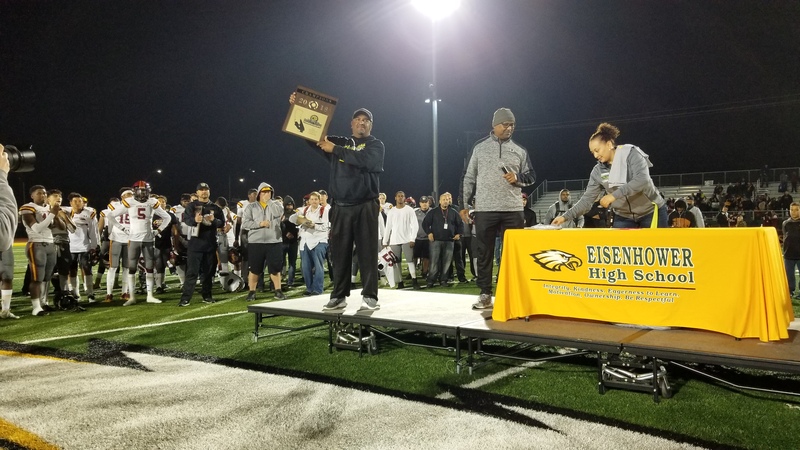 Last week we reported to you that Eisenhower High School Coach Alvin Brown of the CIF Division Champion Eagles football team was forced to step down as Eisenhower’s Varsity Football Coach over continued stalling over offering him his teaching contract allowing him the ability to care for his family..
Well after our story broke Eisenhower and Rialto Unified School District staff stepped up and began talking to Coach Brown again. Coach Brown reached out to us on Thursday February 21st to say that he and Principal Camacho came to an understanding and he will remain as Eisenhower’s Head Coach of the Varsity Football program. This is amazing news because nobody was happy to hear about the possibility of Coach Brown’s departure. Parents, staff, teachers and community leaders all spoke out about the possibility of not having Coach Brown at the helm of Eisenhower’s Varsity program. Coach Brown wanted to thank everyone for their kind words and support now and as the team forged forward this season. 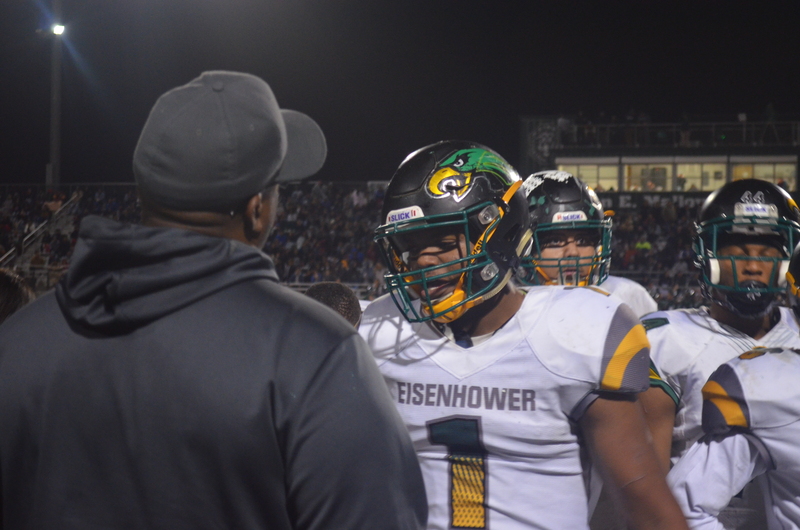 No details on what the agreement that Coach Brown and Principal Camacho came to outside of the fact that Eisenhower will not have a leadership change on the football field for the 2019-2020 football season! Eisenhower coming off an amazing run in the CIF Southern Section playoffs had one more team to conquer Saturday night. 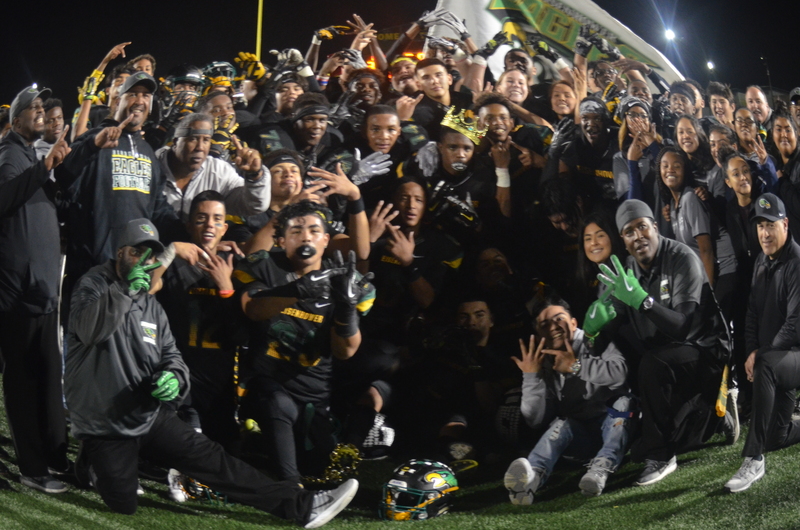 Coming off a CIF Southern Section title win against the Highland Bulldogs the team now had to put that behind them and focus on yet another big game. On yet another cold night these two CIF champs took the field. It was clear early on that Eisenhower had their hands full with the D8 CIF Champion Kaiser Cats. Kaiser had a beast of a Running Back that accounted for all of Kaiser High School 7 touchdowns Christian Hunter. Eisenhower seemed to struggle to stop the 6’ 190 Senior as he sliced his way through the defense with some well done blocking. The Eagles had some amazing highlights as Dayveon “Special” Benton blocked and extra point kick. A majority of the scoring and heavy load was on the backs of the teams key go to players Joel Ayala, Jordan Goodloe and Cesar Ayala. Eisenhower relied on a combination of ground and air assault to push their offense down the field. Kaiser on the other hand used a powerful and effective running game that had Eisenhower scratching their heads. Even though Eisenhower was down three touch downs early they managed to claw their way back into the game and pull within eight points of the Cats. 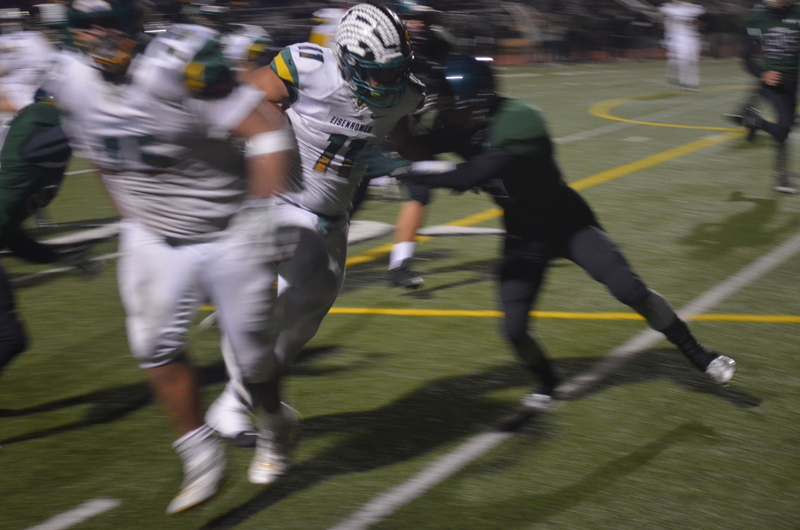 It looked as though Eisenhower would have just under 2 minutes to try and find the endzone as they stopped Kaiser short of a 1st down but Dayveon Benton was called for a facemask giving Kaiser a new set of downs and sealing Eisenhower’s fate. Coach Alvin Brown said one of the reasons this game was so hard was because they got away from the game plan that worked so well over the last 13 games, they were looking to Sacramento and the finals rather than going 1-0 each week. 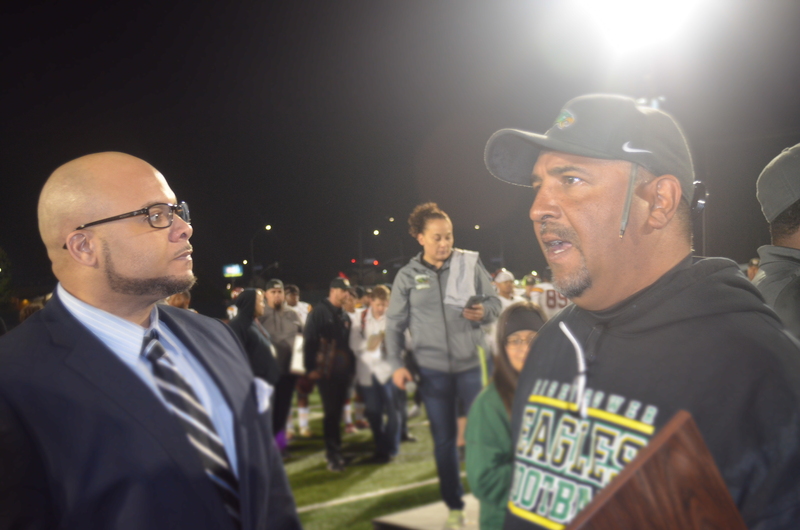 Kaiser Coach Bill Cardosi when asked how he felt after this win he said “exhausted”. Coach Cardosi has a connection to Eisenhower as his father was Ronnie Lotts basketball coach. Coach Cardosi credits the win to “outstanding student athletes and stuck to the game plan and came out victorious”.